"'Hardworking, dedicated, and motivated,' are just a few of the traits that describe Cedric. In the short time since Cedric started his employment at Planet Fitness, he has been one of the hardest working employees. After beginning as an overnight employee, he quickly became a full-time employee in the afternoons, which is during the busiest time of day. While that may seem daunting to others, Cedric embraced it with open arms. He had the most memberships sold for the month of July and was also named Employee of the Month. After interviewing applicants within the company and outside, Cedric was chosen to be the fitness instructor for a different location - which is a testament to his character. I know wherever Cedric's journey takes him, he will continue to excel and do great things with the company and impress everyone along the way." Congratulations to Cedric who is proving that change is possible and to the entire staff at Tulsa Transitional Center who have helped him on his journey. 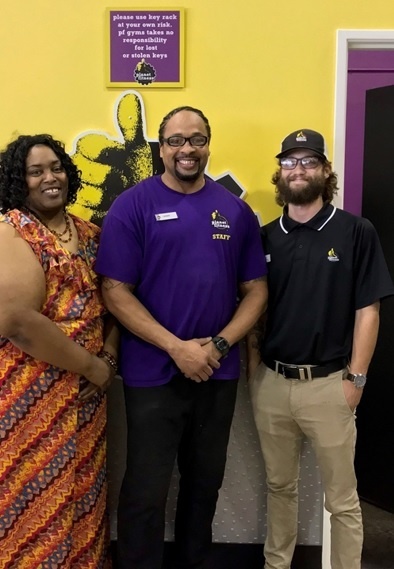 Pictured Left to Right: Employment Specialist Ajuania Baldwin, CoreCivic TTC; Cedric; General Manager Justin Maciha, Planet Fitness.